Metro 2033 is a first person shooter with survival horror elements developed for Windows and the Xbox 360 by 4A Games. The game was released in March 2010 with a sequel (Metro: Last Light) released in May 2013. The game takes place in a post-apocalyptic setting similar to that of the Fallout series except that the game takes place in and around the Moscow subway rather than a massive open world. In Metro 2033 players take on the role of Artyrom one of the first people to be born in the subway after the fictional nuclear war of 2013. The game offers plenty of weapons (both real and fictional) for players to use to dispatch the hostile mutants and humans in the game world. Similar to the Fallout game series mutants will often use physical attacks while humans rely on weapons to hinder the player’s advancement. Like modern first person shooters (and popularised by the Call of Duty series) players do not have a typical health system, instead players are capable of recovering to full health provided they haven’t taken damage in a certain time period. When you aren’t fighting in Metro 2033 you’ll be spending your time scavenging for ammunition which is a rare commodity in the game world and also acts as a currency. 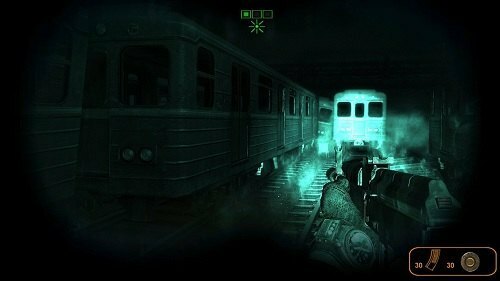 The game tries to capture the survival horror feel by requiring the player to use their flashlight or night-vision goggles to explore much of the metro while also removing most typical interface features. Players will have to rely on visual cues for much of their game information rather than a HUD overlay that is typical of most video games (harder difficulties have even less of a HUD). 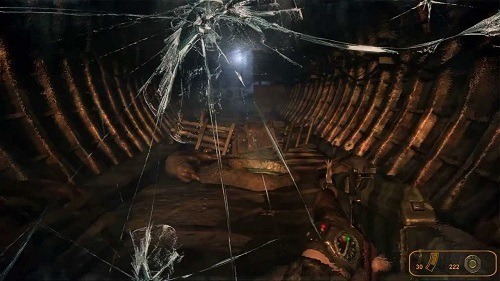 While experiencing Metro 2033 the player will also be presented with a number of moral choices which impacts the ending that the player will receive at the end of the game. Metro 2033 definitely captures the fear and atmosphere that you would expect to have in a post apocalyptic world and complements this with a solid narrative driven experience. Creates a great post apocalyptic atmosphere. Offers a challenging and realistic game on the harder difficulties.